This new round takes PolicyBazaar to nearly $350 million to date. The deal is another investment in India for the Vision Fund, which so far has backed OYO Rooms, Flipkart and Paytm parent One97 Communication among others. PolicyBazaar was founded in 2008 initially as an information portal for learning about insurance and insurance programs. Today, the company operates its own digital insurance brand and a marketplace that aggregates and selects deal from across the industry. Across both services, PolicyBazaar claims to process 100 million visitors in website traffic per year with a transaction volume that’s approaching 300,000 per month. More broadly, the company estimates that PolicyBazaar.com is used to purchase over 20 percent of life insurance coverage in India and seven percent of the country’s retail health coverage. Going forward, PolicyBazaar is targeting 10 million transacting customers by 2020, which it believes it can reach by growing at a compound annual growth rate of 80 percent. “Over the last decade, PolicyBazaar has become synonymous with online insurance shopping in India. 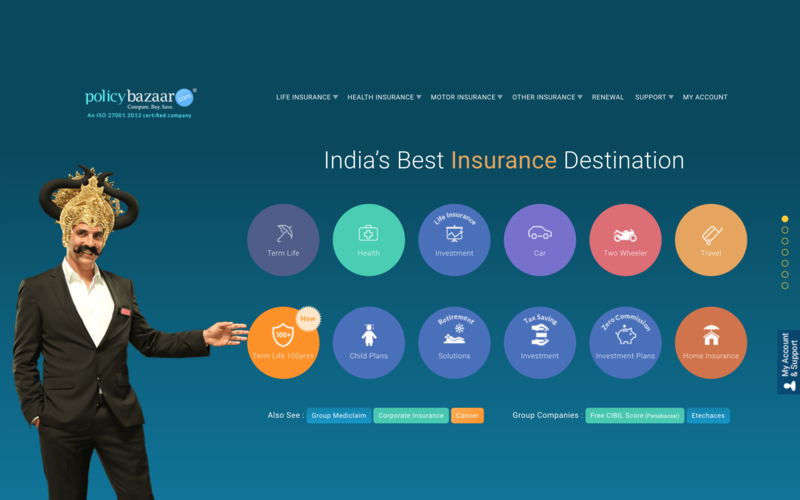 We believe that the Indian insurance market continues to remain massively under-developed and PolicyBazaar, supported by SoftBank’s capital and ecosystem, is uniquely positioned to dramatically increase the adoption of insurance products in the country,” Munish Varma, partner at SoftBank Investment Advisers, said in a statement. PolicyBazaar’s closest ideological rival is Acko, but the two companies are quite contrasted. While PolicyBazaar is a decade old, Acko is very much a newcomer which has raised $42 million since its launch some 18 months ago. Most recently, Acko added Amazon after the U.S. retail giant led a $12 million investment that was announced last month. In addition, Acko founder Varun Dua is a co-founder of Coverfox, an online insurance policy aggregator that also rivals PolicyBazaar.com.